Firefly is an science fiction television series created by writer and director Joss Whedon, under his Mutant Enemy Productions label. Whedon served as an executive producer, along with Tim Minear. The series is set in the year 2517, after the arrival of humans in a new star system and follows the adventures of the renegade crew of Serenity, a “Firefly-class” spaceship. The ensemble cast portrays the nine characters who live on Serenity. Whedon pitched the show as “nine people looking into the blackness of space and seeing nine different things”. The show explores the lives of a group of people who fought on the losing side of a civil war and others who now make a living on the fringe of society, as part of the pioneer culture that exists on the fringes of their star system. In this future, the only two surviving superpowers, the United States and China, fused to form the central federal government, called the Alliance, resulting in the fusion of the two cultures. According to Whedon’s vision, “nothing will change in the future: technology will advance, but we will still have the same political, moral, and ethical problems as today”. Firefly premiered in the U.S. on the Fox network (dumbass) on 20 September, 2002. 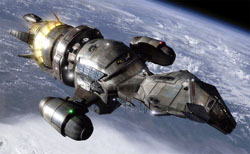 By mid-December, Firefly had averaged 4.7 million viewers per episode and was 98th in Nielsen ratings. It was canceled after eleven of the fourteen produced episodes were aired. Despite the relatively short life span of the series, it received strong sales when it was released on DVD and has large fan support campaigns. It won a Primetime Emmy Award in 2003 for Outstanding Special Visual Effects for a Series. TV Guide ranked the series at No. 5 on their 2013 list of 60 shows that were “Cancelled Too Soon”. The post-airing success of the show led Whedon and Universal Pictures to produce Serenity, a film which continues from the story of the series.